Well I wasn’t planning on publishing a post today, but the current political stance in Lebanon is just too much for me to stay silent. I ask myself, and all those reading my post, to take a deep breath and reflect on all what is going on and consider the following. The US, Saudi Arabia, Syria, France, Qatar, Iran and last but not least Turkey are all supporting the Lebanese sovereignty, civil peace and rule of law. Nevertheless they allow themselves, so freely and so publicly, to engage in Lebanese politics, meet politicians, make deals, negotiate, threaten, support one group over the other…etc. All that just to ensure our SOVEREIGNTY … ironic right? Well it doesn’t stop there…they even hold meetings in their own countries (ie Saudi/US meeting in US, Turkey/Qatar/Syrian meeting in Syria..etc) to discuss and agree on HOW should Lebanon be governed in the coming phase. After that they exchange agreements, refuse deals, work on others and they come here to discuss it with the Lebanese politicians (not strictly the officials…they visit anyone and everyone they want from heads of political parties to individual parliamentarians to ex-ministers…etc) …so much for sovereignty!! Mind you I’m not against diplomacy, international affairs and all the care that Lebanon has always had from the fellow Arab nations and the world, yet I don’t think any country EVER has the right to intervene, directly or indirectly, in the internal affairs. It’s funny and sad at the same time to see nations coming to teach us about diplomacy, democracy, rule of law, what’s right and what’s not…yet most of them just support one party and work with them in a way that ignites polarity in the country, links all the politicians’ decisions and actions with what is agreed on outside the country and put pressure on how should our government and officials act and work to suit the international agenda. Lebanon..my dear beloved country, is struggling …gasping for a breath …and yet all those countries come in to support its sovereignty, but instead of saving it, they’re strangling us all!!! Totally agree……. and this is only Because WE have resigned, ourselves, and gave them the right and the nerves to tutor us about something we invented…. SHAME on all of us….!!!! You’re right Joe …you’re absolutely right…we gave them the right…but its about time we all say ENOUGH!! Sorry brother, I have lost hope a while ago…You know, I’m quite older than you. Tonight, I am ashamed to be Lebanese for the 1st time in my life…. My soul is so sad it’s aching….. This is not the way to build a nation. Let them “ALL” burn in hell. The world’s superpowers have been calling Lebanon for years in order to intimidate and manipulate. The solution lies in unplugging the phone line, so to speak. Are the Lebanese merely enablers? It need not be that way. Maybe within that aching soul of Joe and so many others lies the impetus to say enough. Otherwise, we risk surrendering that very soul completely. Sure they can ring your phone–but they cannot force you to pick it up. Besides, we praise ourselves of being business-minded individuals, the best brokers-traders since the dawn of civilization… and you are asking us not to pick up the phone…are you kidding…!!?? Call me Frodo, then, but acknowledging the ring’s power to override basic human dignity is the first step toward turning our backs to it. Is it impossible or just inconvenient? Is it naive or is it realistic? 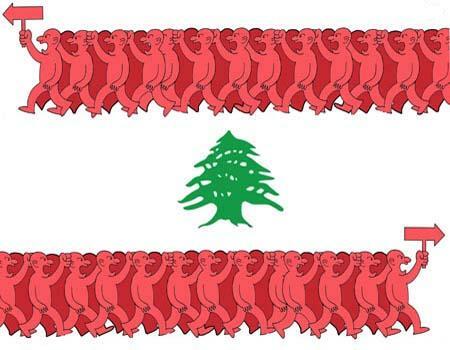 Can the Lebanese identity finally grow up and stand on its own merit? Helas, We are more like Icarus. I like how you two kind of turned the discussion into an analogy of “The Lord of the Rings” hehee…. Joe…I know you’re fed up of Lebanese politics and Lebanese weakness to stand up for themselves, but I have to say we can’t give up! … not for our sake but for the futures to come! Well, I would’ve loved to keep on hoping…. But i feel kinda stupid if i keep believing any of this bunch of liars, who call themselves politicians. It’s a bunch of 128+ vultures, or like a clan of enraged hyenas thirsty for every little drop of blood of their fellow citizens….. I refuse to give them the slightest benefit of doubt anymore, or to accept this greek tragedy like if it was our destiny to eternally keep repeating the same stupid mistake like Sisyphus….over and over again, since 1860…. They are all Guilty… Guilty of the crime of killing the hope for many generations to come….May they all be damned till eternity. “One must imagine Sisyphus happy”. Setting the politicians aside for the moment, where does that leave the ordinary man? Bitter, perhaps. But in relinquishing his hope for something more, he gives away his right to create an alternative. Starting with a clean slate would in a Noah’s Ark kind of way might be refreshing. The question is how to achieve that different path. Anger alone is trouble. I for one would like to focus not on what we are working against, but what we are working toward. It is a simple place to begin. In pratical terms, how do we get there? Ay, there’s the rub. But we will never know unless we try. Even if we thumb our nose and pack our bags to head off to some Pacific island paradise, we risk that the nagging bitterness will follow. Ideas? I like that… Sisyphus happy!!? i don’t know that, muscled for sure. Bitterness put aside and strumming a happy chord; let’s assume that the ordinary man has a choice and he can freely choose his representatives, as a first democratic step in that long path towards change, will his choice be based on the merit, integrity and capabilities of the candidate, or other considerations ? Will it be for a certain political programme, or just because he likes the guy? Or even because he is against that other guy..?? Can he get rid of the “implanted” fear from being “dominated” or even “deleted” by the other…? Can he embrace the national and not stay confined in the personal..? Will he be able to hear or accept the other opinion when he is constantly brain-washed with the fear of inhalation ?…. and so on…. I’m afraid that compromise will always be our destiny. To end this on a positive note, I share with you and Afif your dream and determination to achieve change, simply because I know we can….. Sorry, guess I got carried away by allusions. I referred to Camus’ ‘Myth of Sisyphus’ (http://www.sparknotes.com/philosophy/sisyphus/summary.html), a work I could always count on to provoke a class conversation when I was a teacher. And you don’t seem a pessimist–just a realist. Otherwise, you wouldn’t bother analysing with such very astute observations. My point is that admitting the gravity of the problem is a change in itself. So keep saying what you are saying, as too many won’t acknowledge that the system is doomed. I think we do not need to dream–we need to wake up. Let’s pray for the best.